protest against Jews visiting Jerusalem’s Temple Mount. Jerusalem, Israel — September 9, 2015 … Israel Defense Minister Moshe Yaalon, last night (Tuesday, 8 September 2015), upon the recommendation of the ISA and the Israel Police, signed a declaration declaring the “Mourabitoun” and the “Mourabitat” as illegal organizations, having been convinced that the step was necessary in order to defend the security of the state, the well-being of the public and public order. 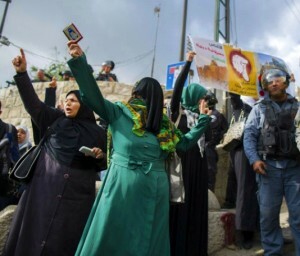 The activities of the “Mourabitoun” and the “Mourabitat” are a main factor in creating the tension and violence on the Temple Mount in particular and in Jerusalem in general. They engage in inciteful and dangerous activity against tourists, visitors and worshippers at the site, which leads to violence and is liable to injure human life. The organizations strive to undermine Israeli sovereignty on the Temple Mount, a 37-acre compound in Jerusalem’s walled Old City which is the holiest site in Judaism and is located next to the Western Wall. Mourabitat attempts to change the existing reality and arrangements at the site and infringe on freedom of worship. They are linked to – and frequently guided by – hostile Islamic organizations including ISIS. The women arrive around 8 a.m. and stay until non-Muslim entry is stopped at 3 p.m. They exchange tips, like how to remain anonymous: Cover your face and change your clothes, including your shoes, before leaving the Israeli-guarded gates. In police interrogations, do not give away your friends’ identities and say you are a student. Security officials say the NGOs that were closed recruited paid activists for both groups so they would visit Temple Mount every day at set times. Activists earned 3,000-4,000 shekels ($771-$1,028) per month, according to the officials. They added some of the funds were sent from the Gulf States, sometimes via couriers, to the West Bank, and from there were transferred to East Jerusalem. The declaration was signed after receiving the approval of Israel Attorney General Yehuda Weinstein and means that those who participate in, organize or finance activity of the “Mourabitoun” and the “Mourabitat” are committing a prohibited act and are subject to trial.